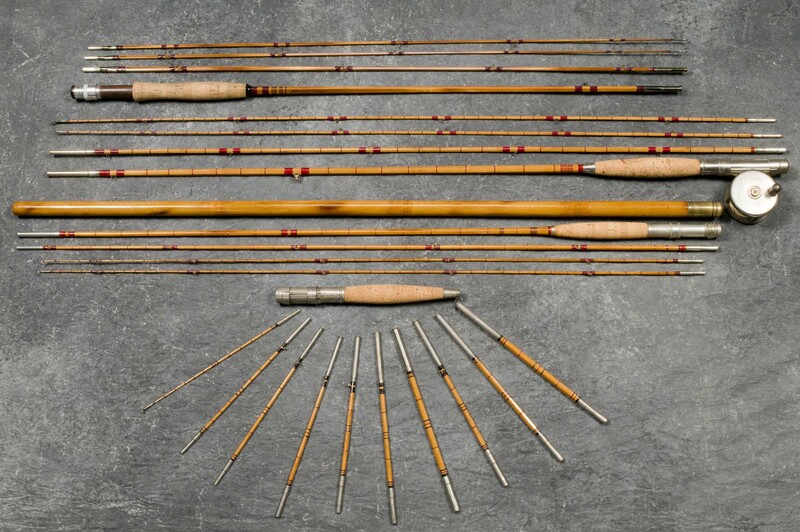 Collection of Fine Vintage Fly Rods at 10:00 a.m.
Collection of Old Penobscot Indian Baskets at 10:30 a.m.
Collection of Antique Lighting at 11:15 a.m.
Offering a diverse selection of antiques and decorative accessories removed from private collections, estates and old households, including the fine fly rod collection of a southern Maine gentleman, the Penobscot basket collections of two long-time Maine collectors and antique lighting from the private collection and former shop of Charles and Laurie Clark of Newcastle NH. Preview by appointment strongly suggested. EARLIER FURNITURE: Fine 90 in. scroll-top walnut tall case clock, descended in the family of Jonas Harley, Harleysville, PA, the compass rose decorated brass dial marked Henry Godshalk, Newbritain (d. 1777). Two inlaid demilune Federal mahogany card tables, one on blocked tapering legs with felt surface and bellflower inlay. 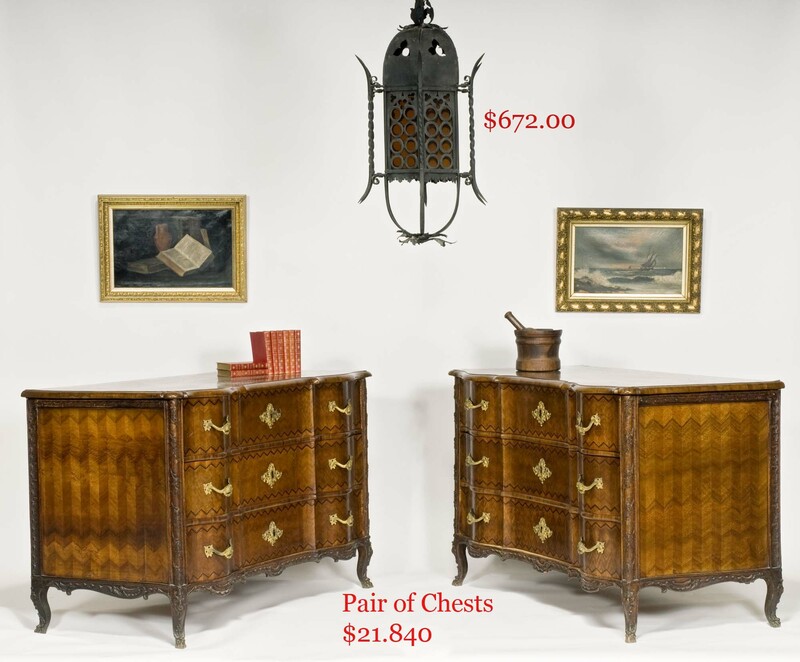 Pair of heavily carved and inlaid 18th c. Continental three drawer chests with brass ormolu hardware. 48 X 51 X 13 in. old blue-green 19th c. two door cupboard top with spoon slots. 18th c. 32 in. round pad foot mahogany tea table. Unusual 18th c. banister back corner chair on sausage-turned base. 25 X 14 in. Pine Queen Anne chip-carved mirror. 18th c. one drawer blanket chest in old red-brown paint. 18th c. maple two drawer blanket chest. Set six old red NH ladderback side chairs. Numerous early tripod candlestands of varying design. 18thc. and 19th c. hanging shelves. Pair 19th c. whalebone peg racks from early Westport, MA home. Old blue 19th c. hanging plate rack. 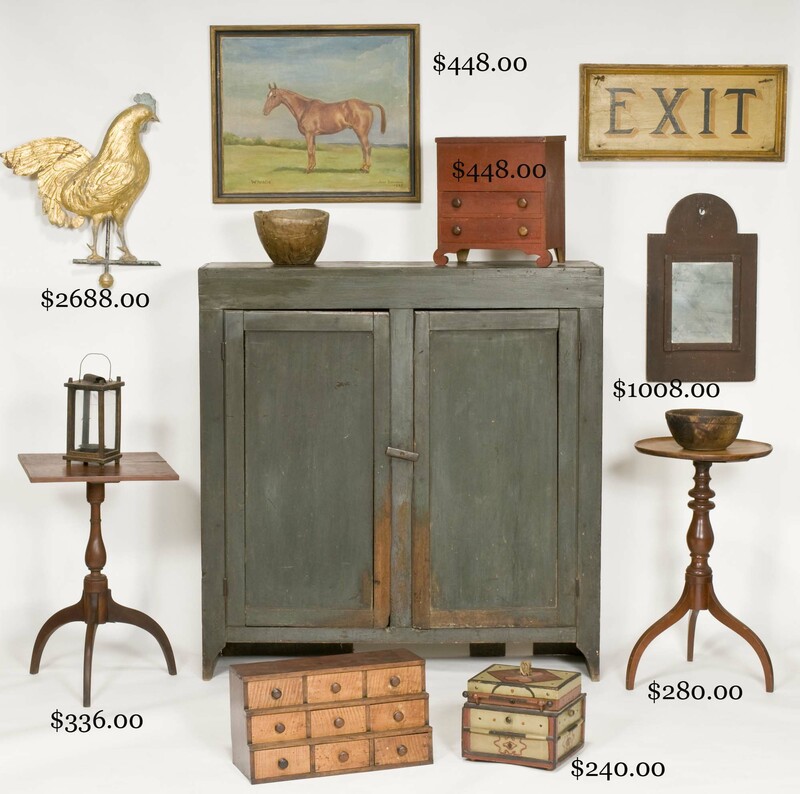 18th c. hanging pine game rack. Rope leg N.E. 19th c. sewing stand with bag drawer. Brass-bound camphor chest. Hannah Davis (on right) and another 19th c. band box. Miniature old red two drawer blanket chest. Three tier stepback set of nine curly maple storage drawers. Early blanket, storage and deed boxes in paint and decoration. 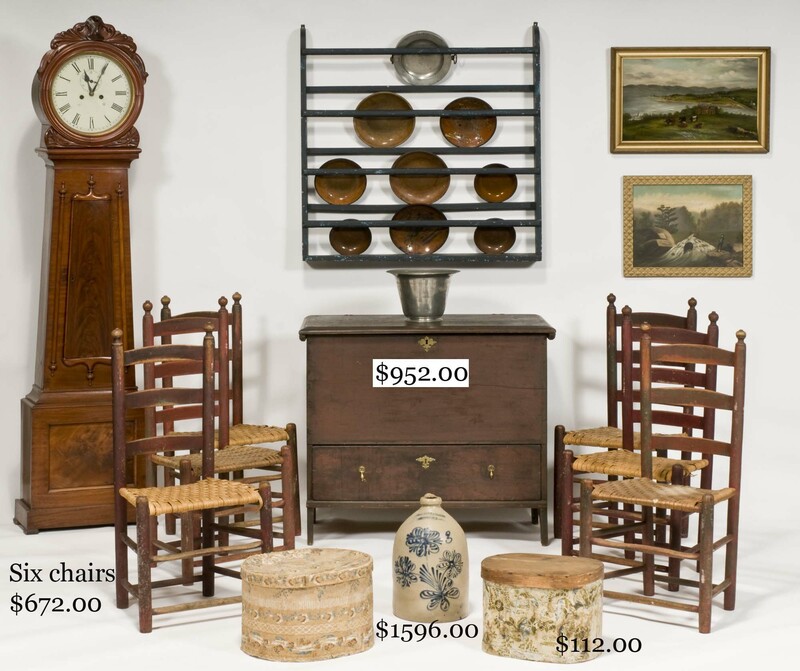 American and English mahogany and decorated occasional furniture. 18th and 19th c. side chairs, including bulbous-turned fanback windsor. Painted country rockers. Distinctive 20th c. wing chair. 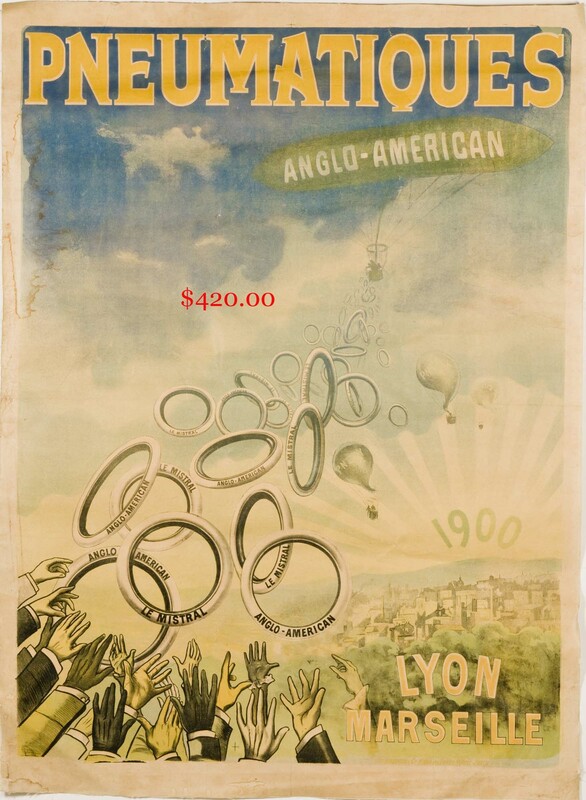 Paris Mfg. child’s sled with moose. VICTORIAN FURNITURE: 58 X 42 in. leaded glass oak bookcase on turned feet. Round oak china cabinet with carved splash. Good upholstered walnut gent’s armchair. Mission oak library desk. 5 ft. wicker settee. 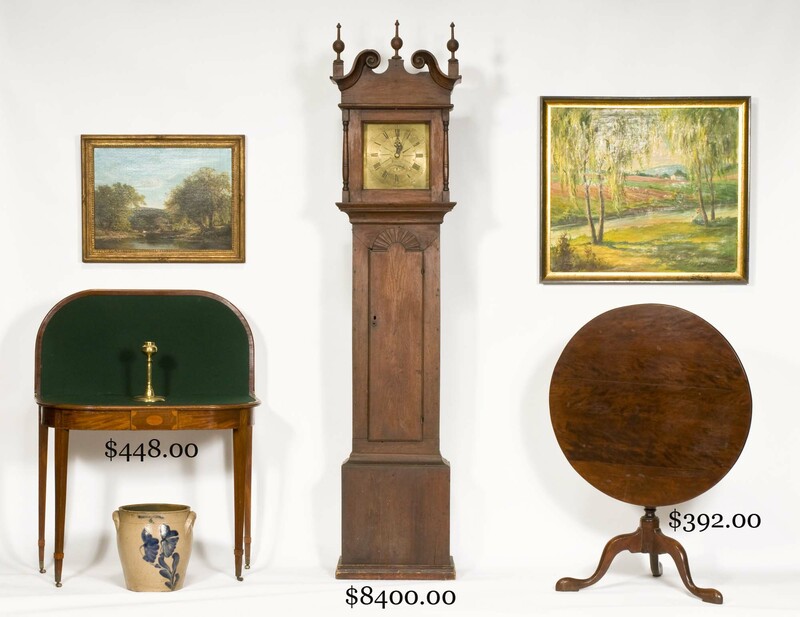 19th c. shelf clocks. Jerome Thibouville-Lamy ( No. 36978) six tune music box. Edison cylinder player and more. 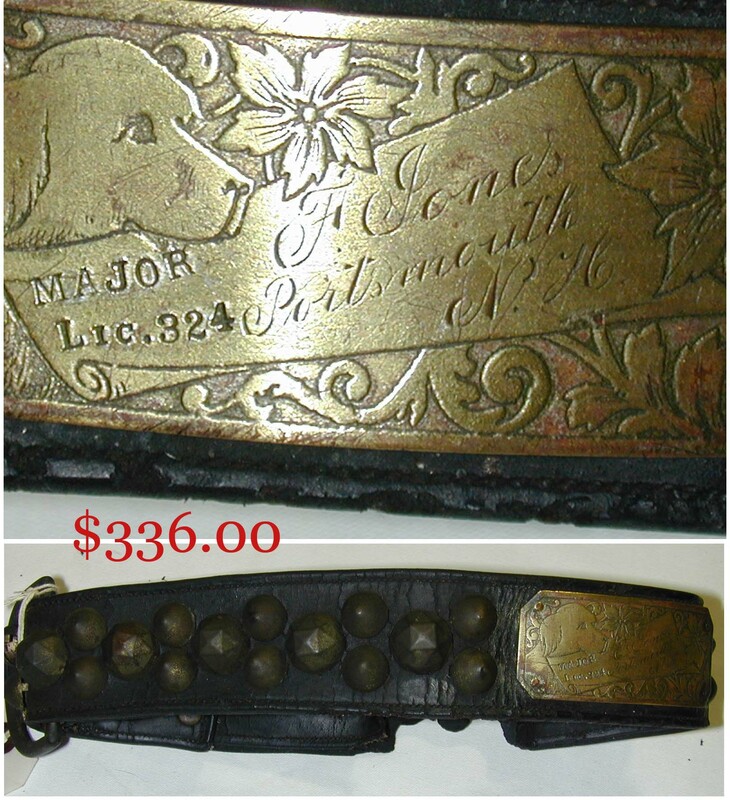 ACCESSORIES: The studded collar from (brewer) Frank Jones’ dog, “Major”, Portsmouth, NH, so inscribed on its brass tag. Early 19th c. powder horn, inscribed John Chamberlain, his horne, No. Hampton, NH. Early Benz signed brass eyeglasses. Early bronze pewter spoon molds. 19th c. folding knives. S. Thaxter, Boston, boxed compass. Decorative deep-carved architectural panel. Early architectural hardware. 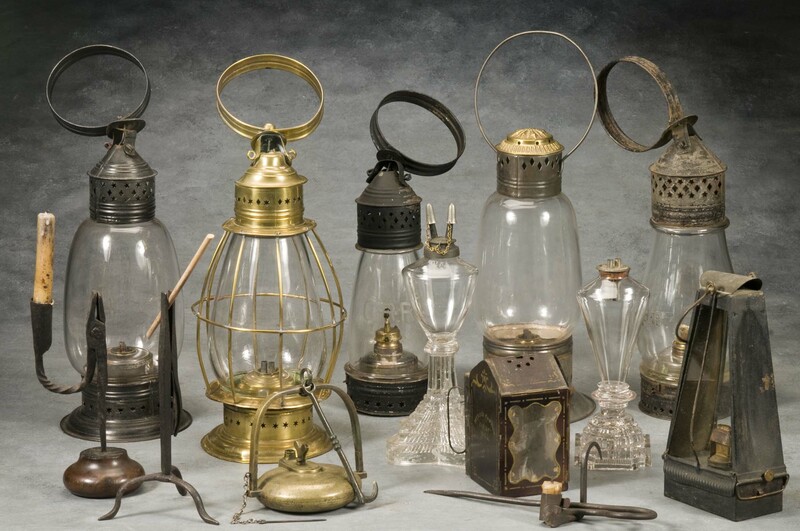 Early and fancy wrought iron architectural light fixture and other hanging glass fixtures. Interesting old signs. Early inks. Still banks. Gnome, terrier and floral doorstops. Banquet and piano lamps. Decorated toleware. 18th and 19th c. English pewter hollow-ware. Early iron cookware, broilers, implements and warmers. Fireplace accessories. 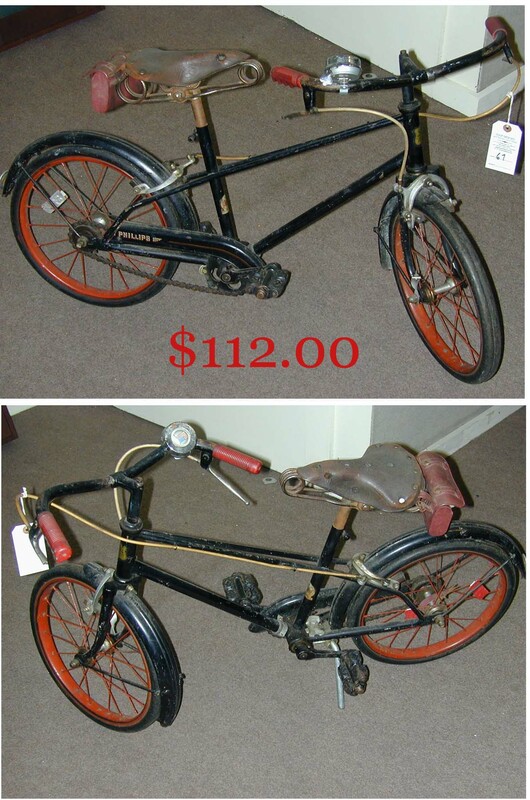 Early 20th c. Phillips child’s bike with hard rubber tires. 54 VINTAGE TENNIS RACKETS. Selection of good 19th c. woodworking molding planes, chisels, folding rules, 12 in. cast spirit level with inclinometer, etc. 1500 lb. cap. Buffalo beam scale. EARLY AMERICAN WOODENWARE: Decorated burl bowls. Painted boxes, firkins and bowls. Better kitchen accessories. Good baskets. Rush light trammel. FOLK ART: Carved and paint decorated 19th c. sewing box with hearts. 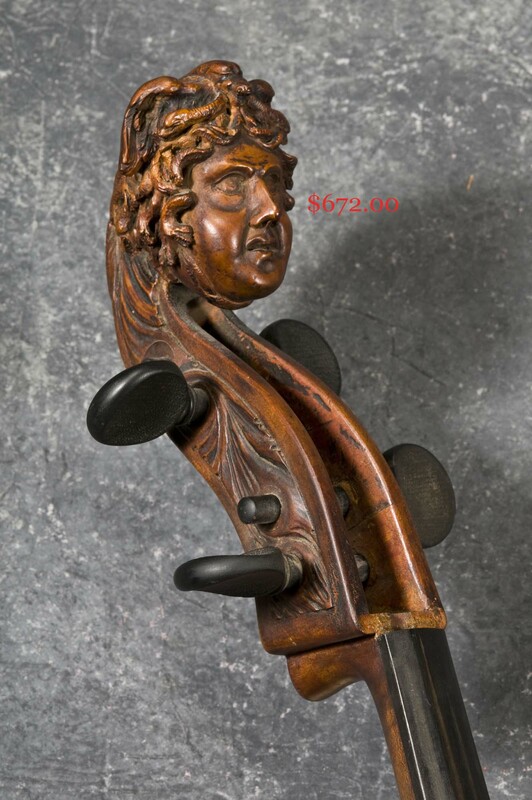 18th c. Italian carved cello head in the form of Medusa. 22 X 19 in. gilded hollow copper rooster weathervane. Mason, Harris, W.H. 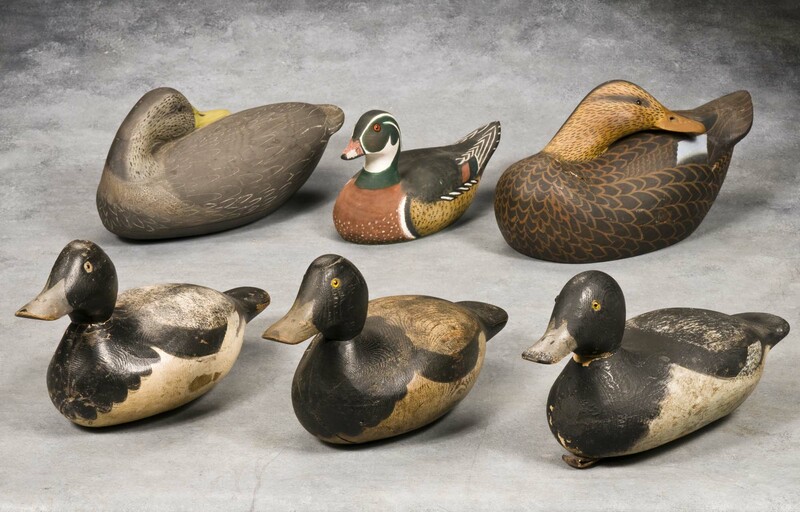 Cranmer and Hurly Conkling decoys and twenty-one additional working decoys from one RI rig (Three lots: 765, 766, 767). Signed French 15 in. papier mache female busts. 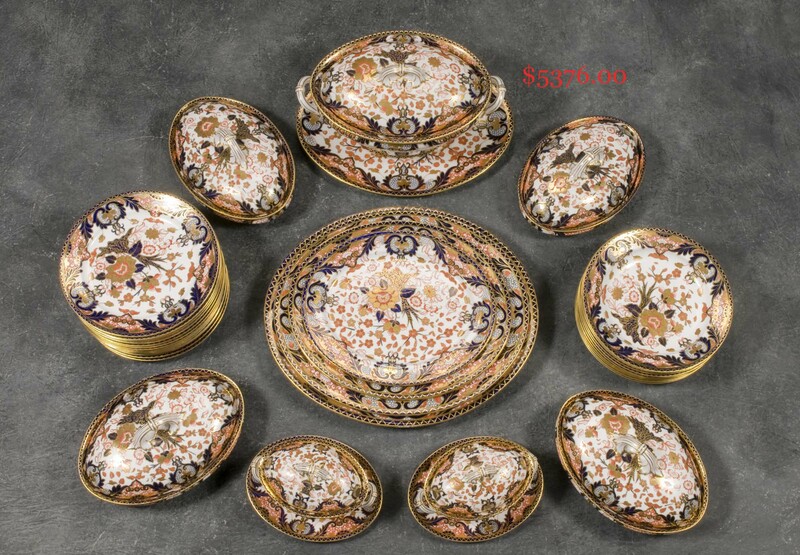 ESTATE CHINA AND GLASSWARE: 104 piece set of Royal Crown Derby dinnerware in the Imari colors. 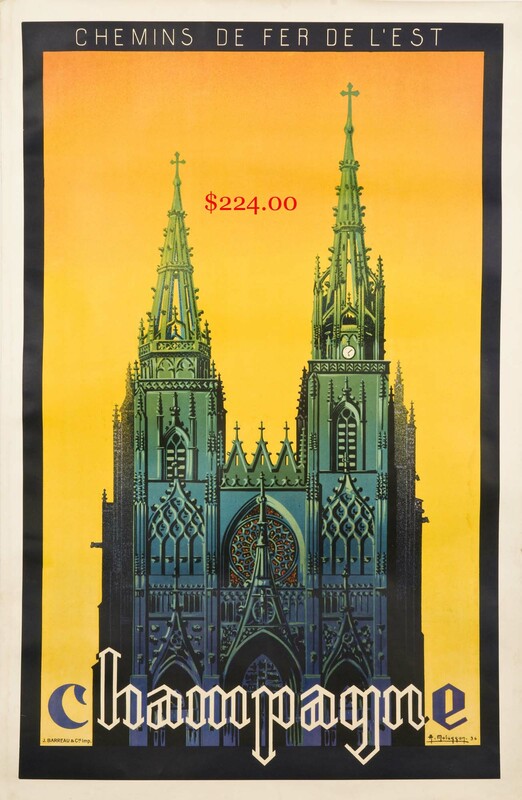 Rare Royal Bayreuth. Good Staffordshire. Royal Worcester shell-form vase. Early yellow-ware, sponge and spatter ware, Good Rockingham. Selection of patterned white ironstone. Children’s decorated mugs and plates. Southwest Indian pottery. Early blown wines. Fine Victorian colored crystal, cranberry and amberina. Colored and patterned syrups. Cobalt rolling pin. 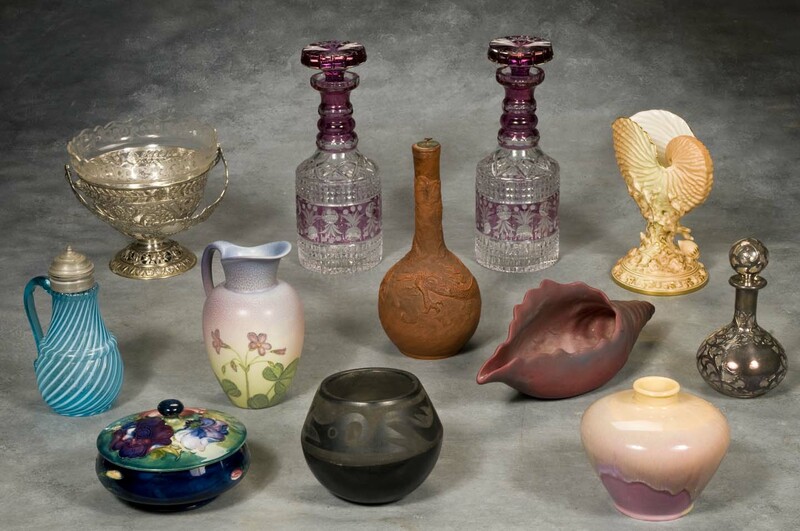 Oriental scent bottles. Decorated stoneware. ART POTTERY: Rookwood, Van Briggle, Moorcroft, Anne Green, etc. ESTATE STERLING: “Treasure” pattern flatware service for twelve. Other partial sets and much misc. flatware and fancy utensils. Cheltenham “Chatsworth” five piece sterling tea set. Fancy sterling and silver-plated baskets. Other Victorian silver-plated ware. 7 in. overlay cologne. Early coin utensils. ESTATE JEWELRY: Gold, sterling and gemstone jewelry. Victorian and later costume jewelry. Howard and other pocket watches. 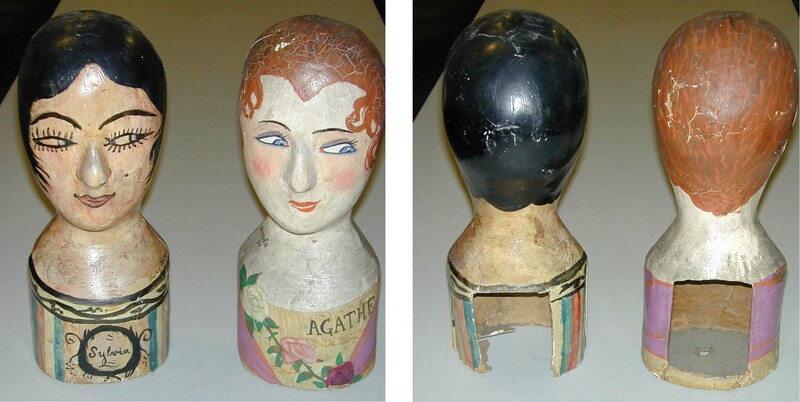 OLD DOLLS AND TEDDY BEARS: Kestner, Heubach, A. Marseilles and other bisque head dolls. 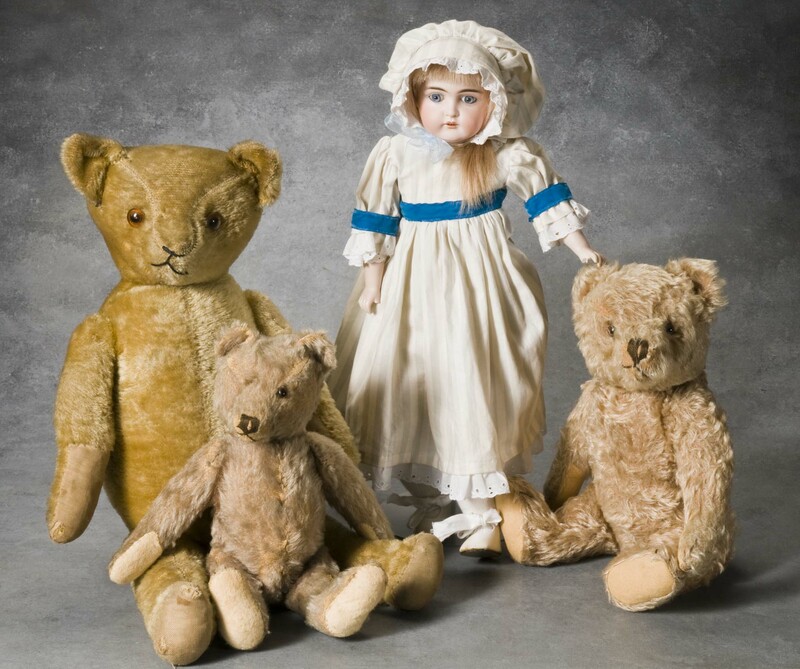 Steiff, Ideal and another teddy bear. OLD RUGS, TEXTILES AND VINTAGE CLOTHING: Three large area oriental carpets. 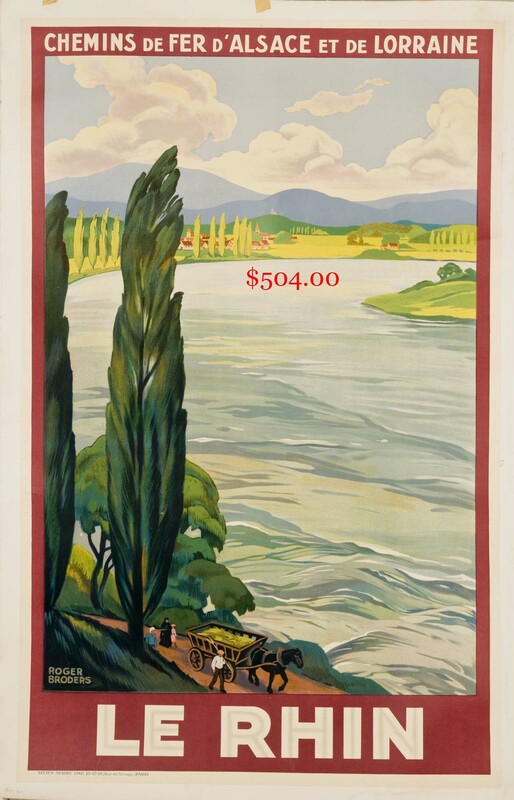 C. 1940 winter scenic hooked rug. Graphic old quilts and coverlets. Decorative oriental embroidered silk panels. 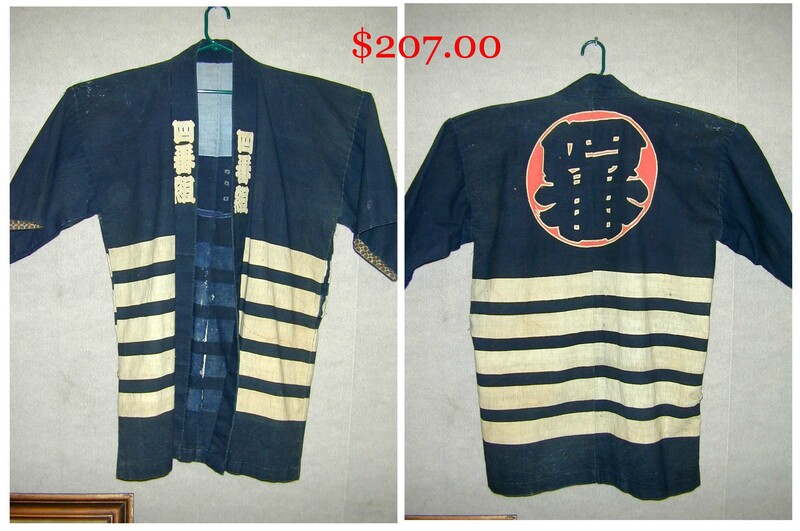 C. 1900 Japanese linen fireman’s Happi coat. Lady’s 19th c. black winter bonnet. Lace and trim. 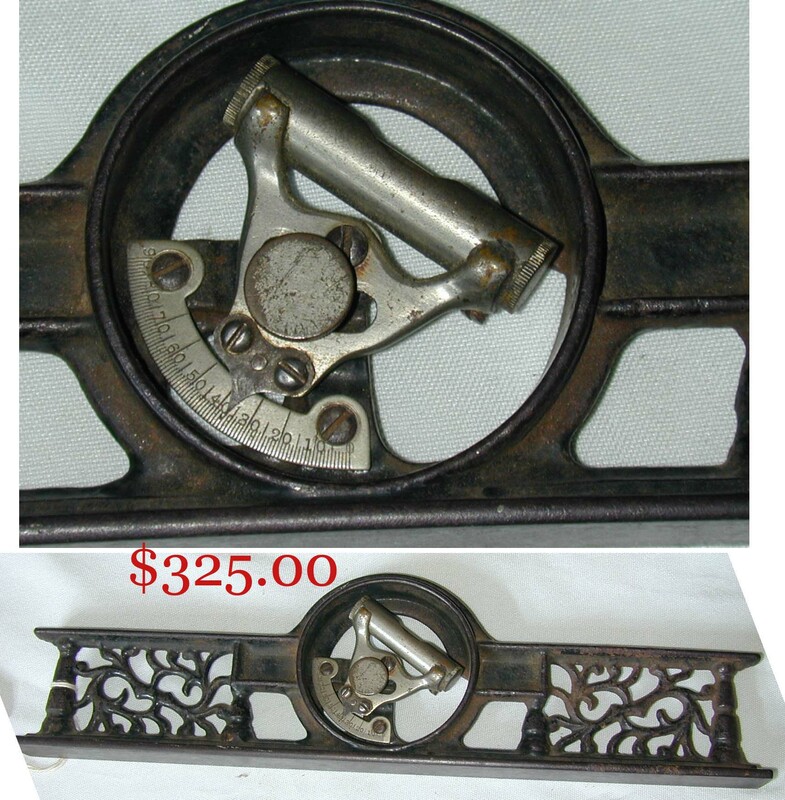 Old sewing accessories. OLD TOYS: Early windups, incl. Lehmann Tut Tut, Tap Tap and OHO, unmarked rabbit on scooter and drumming bear. Cast iron 10 in. Kenton fire pumper, Royal Circus wagon, horse and sulky, crouching and standing pig banks, et. al. 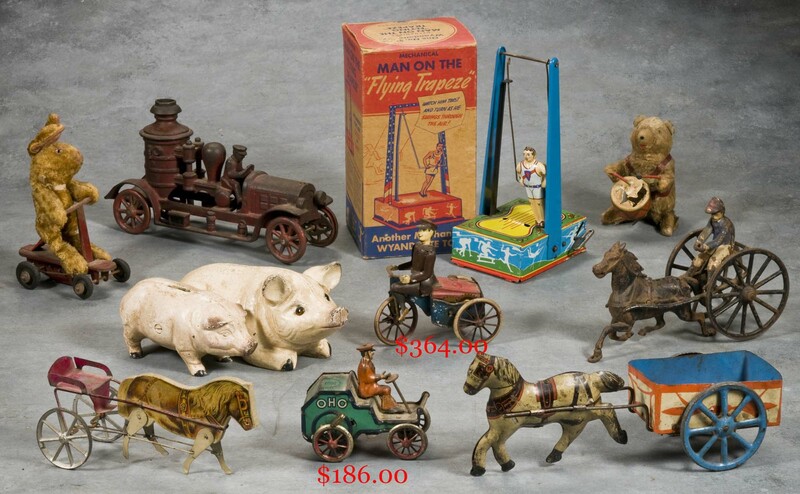 Early “Dandy” horse cart and Gibbs pony cart. Man on Flying Trapeze windup. 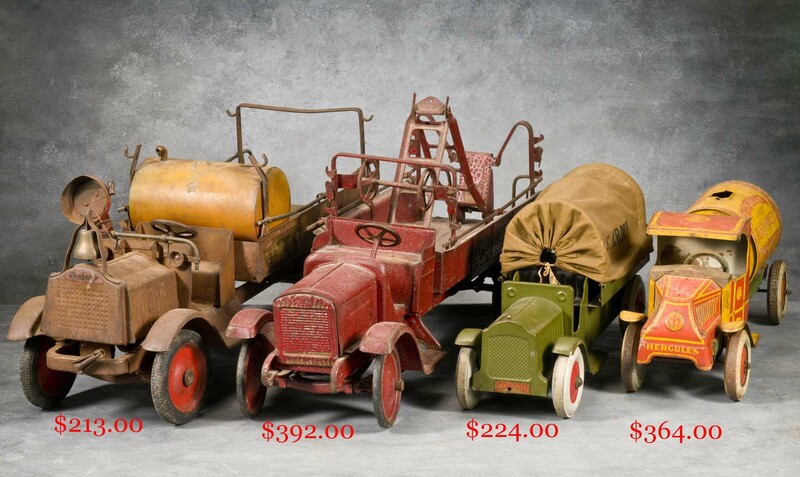 Pressed steel trucks, incl. Keystone Chemical Pump Engine, Steelcraft ladder truck, Lumar dump truck, Chein “Hercules” concrete truck, Structo U.S. Army troop carrier, good pedal race car and more. Early Betty Boop baby quilt. McLoughlin Dissected Map of the U.S. Boxed sets of litho’d. children’s blocks. 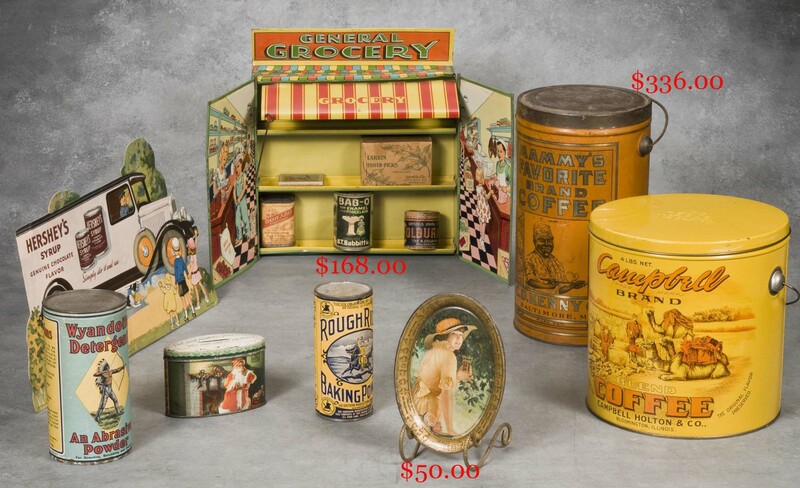 Foldout toy tin General Grocery and more. ADVERTISING: Rare “Mammy’s Favorite” and Campbell 4 lb. coffee tins. 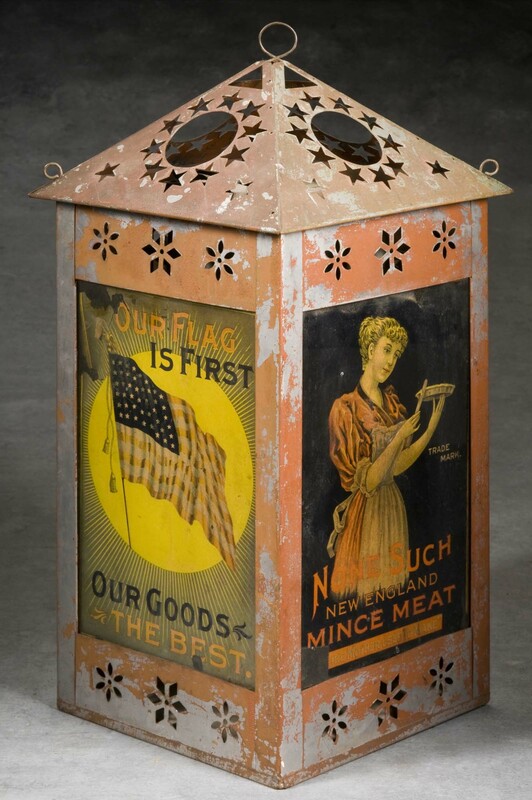 Other good advertising tins and lanterns. Early Coke tip tray. Hershey’s Syrup cardboard counter ad. Railway Express and Maine Central RR Ticket signs. 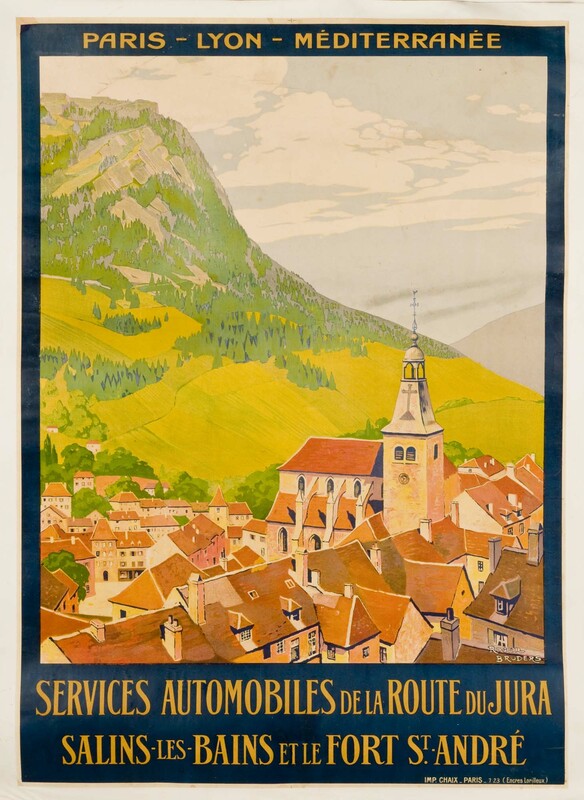 Early French TRAVEL POSTERS by A. Mollugon and Roger Broders (another), 1900 Rossuth & Cie. tire advertising poster and more. OLD BOOKS, PAPER AND PHOTOGRAPHY: Bell’s History of British Quadrapeds. and History of British Reptiles. Other books on birds and insects. 1890’s The Yellow Book. Benj. Edes 1780 Constitution….in Convention (MA). Mr. Dunlap’s Oration, 1832. Parish’s 1812 Modern Geography. Boxed Johnson’s New Illustrated Family Atlas, 1866. Gabriel’s 1925 The Night Before Christmas. More books. 1848 Phillip Carrigan dissected map of New Hampshire. 1857 J. Chace, Jr. Rockingham Co., NH wall map. Two part 1901 U.S. Geol. Survey map of Boston and Vicinity. Sel. of 19th c. NH newspapers, incl. Mt. Washington’s. York, ME area and N.E. ephemera. 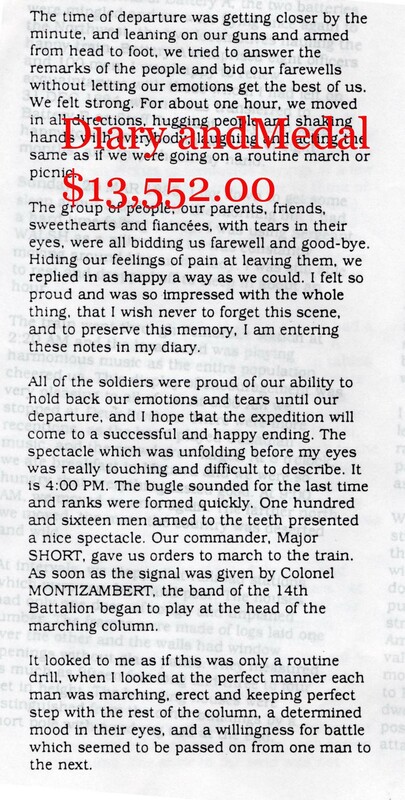 The handwritten (then translated) diary of Sgt. N. A. Savignac, recounting his experience with the R.C.A. 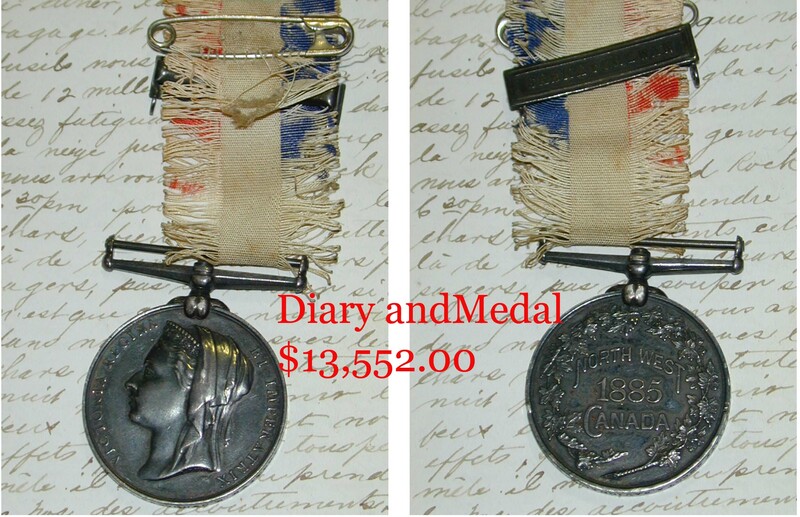 in the 1885 attempt to quell the uprising of Amerindians in Northwest Canada led by Louis Riel, the account accompanied by a commemorative medal with his name inscribed thereon. Fifteen CIVIL WAR letters written by Austin Wallace, 22nd Mass. Reg., recounting an encounter with the Merrimac, burials at Bull Run and more. Civil War discharge certificate, in-uniform CDV and G.A.R. items belonging to Clodman Norman, 118th Reg., NY Vols. 1912 T. Roosevelt signed thank you note, 1894 T. Roosevelt signed Civ. Service Comm. letter and handwritten rough draft by Boston City Club’s Archibald Peabody Gardner naming T. Roosevelt as their first choice for the Presidential nomination. Trade cards, post cards and scrap albums. Travel paper. Old snap albums and older portrait photography. Cocorico and Patheorama viewers and films. OLD PAINTINGS AND PRINTS: 17 X 23 in. 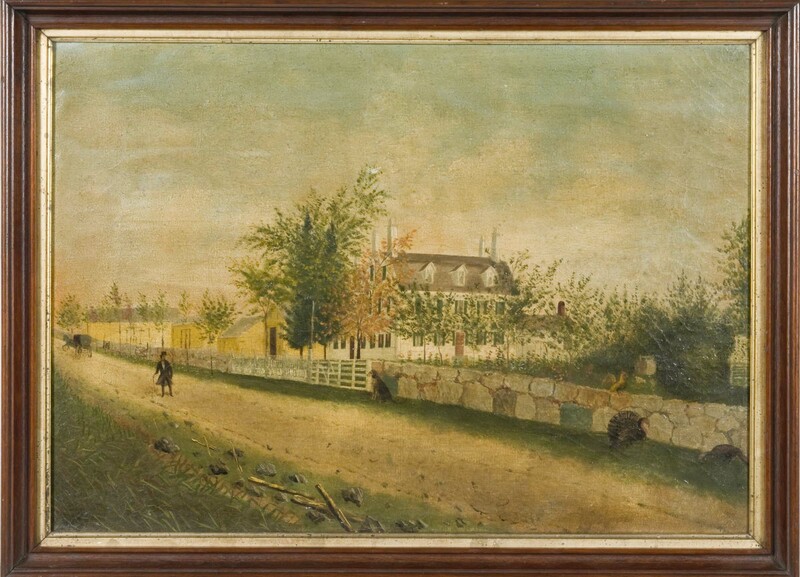 D.C. Boutelle, 1856, riverscape with fisherman. 13 X 9 1⁄2 in. 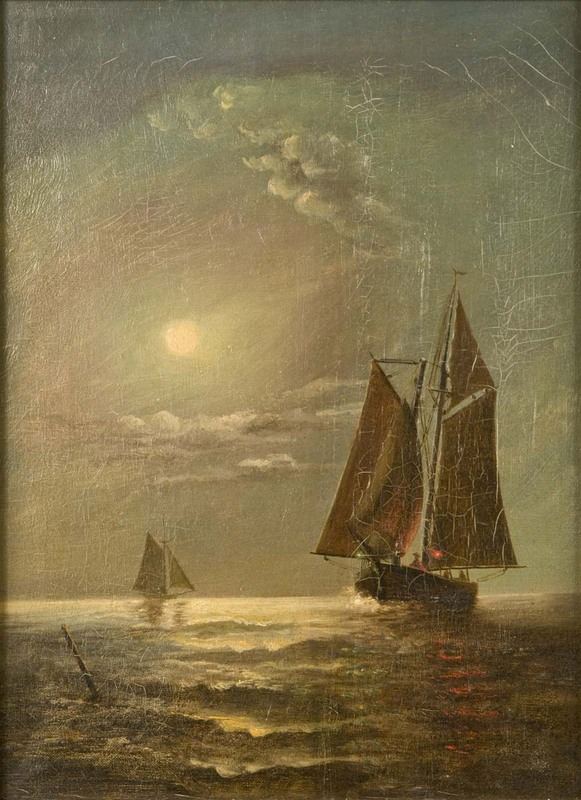 o/c of nighttime fishing boats, attrib. to James Gale Tyler. Primitive 14 X 20 in. 19th c. o/c of grand farmhouse with animals and outbuildings by an in-town road. Early 19th c. European 7 1⁄2 X 6 1⁄2 in. o/p of checker players by candlelight. 29 1⁄2 X 24 1⁄2 in. oil portrait of Col. Samuel Hollingsworth (1757-1830), post-war Baltimore merchant. 28 X 32 in. Charles L. Wrenn oil farmscape by river. Davis and Gerard miniatures of Napoleon and Josephine. C. Freeman o/c of dead rabbit. North Shore, MA, oils by A. L. Morse and C. O. Morse. Still life oils of fruit and books on tabletop. 14 X 18 in. primitive N.E. o/b of fisherman with wife looking on. 14 X 22 in. N.E. coastal landscape oil with cows. 20 X 24 in. Jean Bowman, 1935, o/b of horse, “Wheatie”. 12 X 19 in. Kirsche o/c of fishing boats. 19th c. pencil drawing entitled Italy-Naples and Vesuvius. Early 20th c. colored NH photos. TERMS OF SALE: Cash or approved check. Mastercard and Visa accepted. 12% Buyer’s Premium. 5% ME Sales Tax applies to all purchases without copy of a current resale exemption certificate. Written or oral descriptions subject to error or omission. Absentee bids accepted until 9:30 a.m. on auction day. Sale catered by Through the Grapevine Caterers, Eliot, ME.